In normal parlance the term "philatelist" and "stamp collector" are used synonymously, with many non-collectors often saying "what is that fancy word used to describe stamp collecting? I know it is "phil-a something. I can't pronounce it". Most collectors will then tell the person that a stamp collector is a "philatelist" or will otherwise agree with the person who equates the two, as if the two were playing a game of Trivial Pursuit. 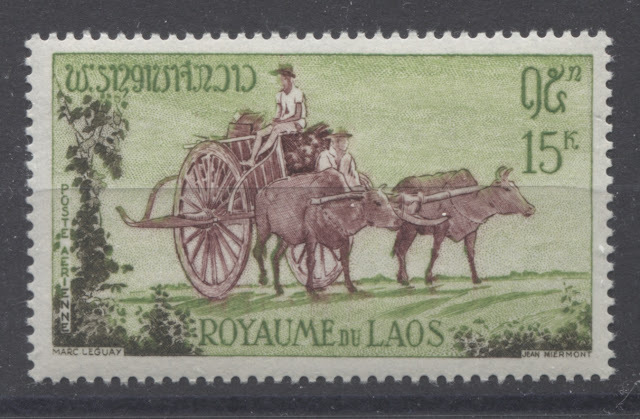 But as a dealer and professional philatelic blogger, it has occurred to me that philately and stamp collecting, though very close to one another, are not, in fact, the same thing. In the rest of this post, I will explain the difference between the two, and then I will conclude with some more reasons why I believe that both are the most rewarding of hobbies, and why I believe they are misunderstood by most people in general. Today's post will be my last post for 2017, as I need to take a few days off over Christmas and spend some time doing something other than studying stamps! However, I will try to make it a fairly meaty post, to give you lots of material to consider over the holidays. Today's post will examine all of the remaining booklets other than those containing the 8c Parliamentary Library stamp. Those will be covered in my first post of the New Year. Unfortunately, there is one booklet that I will discuss today that I do not have an illustration of: the 6c black booklet pane of 25, perf. 12.5 x 12. I had ordered one last week, specifically so that I would have it to scan and include an image of here today, but it hasn't arrived yet. However, I will update this post with an image, as soon as it does. Today's post will be the first of four posts that will explore the alternative issue formats in which the stamps of this issue were available, other than the basic sheet stamps. 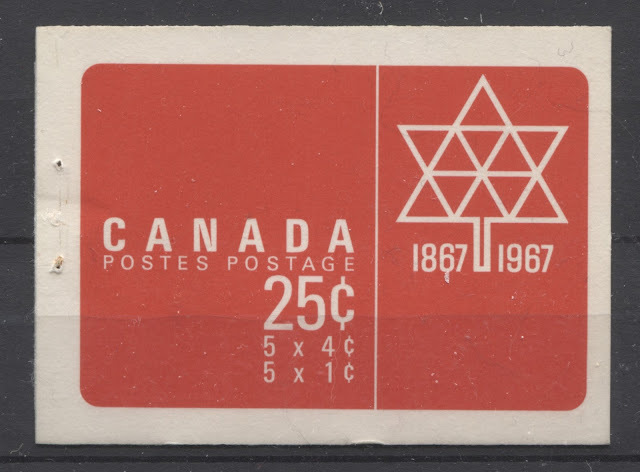 For decades the stamps of Canada have been available in booklets and in coil form, and this issue was no exception. 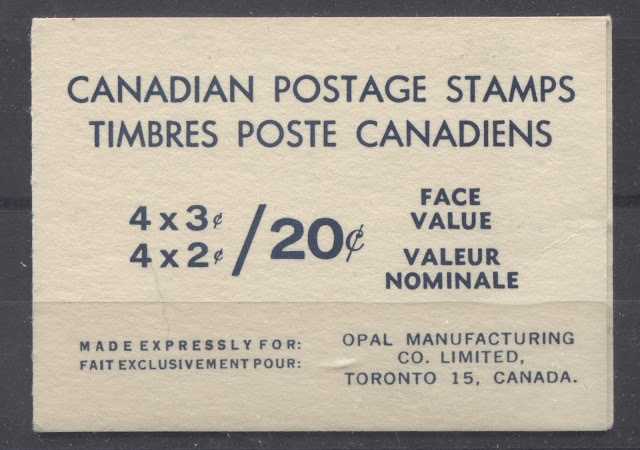 In addition, starting with the 1954 Wilding Issue, some of the stamps were available in large panes of 25 or 20, that were sold sealed in large cellophane packages. The 4c and 5c stamps of this issue were also issued in this form until the end of 1967, when this format of issuing stamps was abandoned in favour of larger integral booklets. Today's post will examine the two stapled booklets that were issued in 1967, and which were replaced, by integral booklets that were printed by the BABN, starting in 1968, and continuing for the remainder of the life of this issue.